On September 1, 2015, freelance investigative journalist Khadija Ismayilova was convicted on charges of embezzlement, illegal entrepreneurship, tax evasion, and abuse of power in a closed-door trial and sentenced to seven-and-a-half years in prison. On May 25, 2016, Ismayilova was released on probation and granted a suspended sentence in a Supreme Court decision rendered in Azerbaijan’s capital, Baku. However, she remains subject to a travel ban and has not been able to leave Azerbaijan since her release. Khadija Ismayilova is the winner of the 2015 PEN/Barbara Goldsmith Freedom to Write Award. Khadija Ismayilova is an award-winning freelance reporter who has worked for various Azeri–, Russian–, and English–language news outlets. She is an outspoken advocate for press freedom and human rights in Azerbaijan and has repeatedly called for the release of dozens of detained and imprisoned Azeri journalists. Her most high-profile journalism work has been with Radio Free Europe/Radio Liberty (RFE/RL), where she worked from 2008 to 2010 as bureau chief and later as a staff reporter. Despite the highly oppressive and government-controlled media environment in Azerbaijan, Ismayilova published several investigative pieces in international outlets exposing official corruption—including reports on alleged embezzlement, secret mining interests, and illegal business ownership by President Ilham Aliyev and his family. Ismayilova’s reporting on official corruption has made her the constant target of judicial harassment, threats, and personal smear campaigns. 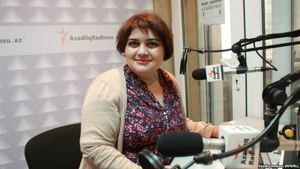 January 10, 2019: European Court of Human Rights rules that the Azerbaijani government violated freedom of expression laws and failed to investigate privacy violations in Ismayilova’s case. The court ruled that Azerbaijan must pay Ismayilova damages. January 30, 2018: Baku Court of Appeal holds a hearing on the appeal of the travel ban on Khadija İsmayilova and rules to uphold the ban. İsmayilova had been invited to Sweden to receive an award from the Right Livelihood Award Foundation for her work as a human rights defender. Ismayilova brings the ceremony invitation letter to be used as part of the hearing but the court does not allow the letter to be considered. This is the third time that the court refuses to lift her travel ban. Ismayilova proceeds by appealing the Court of Appeal’s verdict with the Supreme Court. September 2017: Ismayilova is named one of the 2017 recipients of the Right Livelihood Award – often referred to as the “Alternative Nobel Prize,” which honors daring endeavors in human rights, public health, and good governance. February 2017: Ismayalova’s internet and phone services are temporarily shut off just as she was scheduled to speak via conference call at a European Parliament panel discussion on human rights violations in Azerbaijan. Ismayilova is seeking a full acquittal. May 2016: Ismayilova is released on probation and granted a suspended sentence in a Supreme Court decision. The Supreme Court drops the charges of embezzlement and abuse of power and changes the sentence to a 3.5-year suspended term, upholding charges of tax evasion and illegal business activity. She must now live in Baku while on probation, and is subject to a five-year travel ban. Ismayilova continues to face government harassment. December 2015: To mark the one-year anniversary of Ismayilova’s arrest, nearly 70 journalists, researchers, and supporting organizers convened in Turkey to recommit to finishing the anti-corruption work and writings that Ismayilova started. The stories can be found here. July 2015: The first hearing for her trial is on July 24. On August 21, the prosecution requests a nine-year prison sentence. On September 1, 2015, Khadija Ismayilova is convicted on charges of embezzlement, illegal entrepreneurship, tax evasion, and abuse of power in a closed-door trial and sentenced to seven-and-a-half years in prison. On November 25, an Azerbaijani appellate court upholds the guilty verdict against Ismayilova, confirming her sentence. Ismayilova is acquitted on a previous charge of inciting a colleague to suicide after the accuser recanted his allegation. February 2015: On February 13, 2015, the Azerbaijani Prosecutor General’s Office also charges Ismayilova with embezzlement, illegal entrepreneurship, tax evasion, and abuse of power. Khadija is convicted in a closed-door trial on February 24 on separate charges of libel and criminal defamation after she posts on Facebook an apparent contract from the Ministry of National Security hiring an informer to infiltrate the political opposition. December 2014: On December 5, 2014, Ismayilova is arrested and placed in pre-trial detention for two months in connection with charges that she incited a former colleague to commit suicide after she allegedly pressed RFE/RL’s editorial staff not to rehire him—allegations her editors deny. Her detention is extended twice. 2013: Ismayilova is detained after she participated in an unsanctioned protest against police abuse. Arguing that she broke no law, she refuses to pay the 500 manat fine leveled against her and is instead sentenced to 220 hours of community service sweeping the streets. Ismayilova dubs her community service “Sweeping for Democracy,” and a number of her social media followers pledge to join her, at which point the government attempted to change her community service to a less-public venue, cleaning at a rehabilitation facility. When Ismayilova refuses, the government threatened her with three months in prison. 2011: A camera secretly installed in her home films Ismayilova and her boyfriend during an intimate moment—the footage is later used in an attempt to blackmail her into stopping her corruption investigations. She refuses, and the video is released on the Internet. Despite Ismayilova’s reporting the threat to police prior to the release of the video, Azerbaijan’s Attorney General’s Office only begins its investigation when the footage was made public. Azeri police have yet to identify and prosecute those responsible.